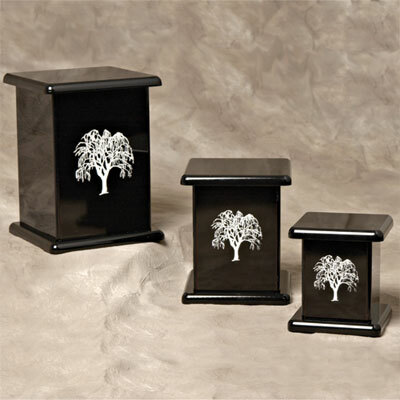 MCS Supply Inc. is a leading supplier for pet urns, pet tins, clean-out brushes, and carcass bags for the animal cremation industry. The Contemporary Collection From MCS Supply Inc. Contemporary styling. Laser-etched with exquisitely detailed rose design. Black acrylic with high-gloss finish. The bottom is removable for access and is secured by 2 screws. 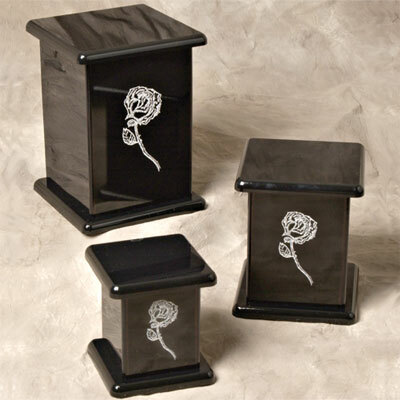 CSR (Small Rose) 4" x 4" x 4½" 24 Cubic"
CMR (Medium Rose) 5" x 5" x 6" 61 Cubic"
CLR (Large Rose) 6" x 6" x 8" 150 Cubic"
Contemporary styling. 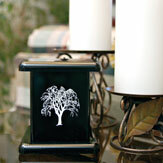 Laser-etched with exquisitely detailed willow design. Black acrylic with high-gloss finish. The bottom is removable for access and is secured by 2 screws. CSW (Small Willow) 4" x 4" x 4½" 24 Cubic"
CMW (Medium Willow) 5" x 5" x 6" 61 Cubic"
CLW (Large Willow) 6" x 6" x 8" 150 Cubic"